with <font size=”4”>&upsilon;</font> being the kinematic viscosity. For more details, see Eq. (15) in (Li2014_JCP). The following coefficients must be defined in eDPD system for each pair of atom types via the pair_coeff command as in the examples above. The keyword power or kappa is optional. Both “power” and “kappa” require 4 parameters <font size=”4”>c<sub>1</sub>, c<sub>2</sub>, c<sub>4</sub>, c<sub>4</sub></font> showing the temperature dependence of the exponent <center><font size=”4”> <i>s</i>(<i>T</i>) = power_f*(1+c<sub>1</sub>*(T-1)+c<sub>2</sub>*(T-1)<sup>2</sup> +c<sub>3</sub>*(T-1)<sup>3</sup>+c<sub>4</sub>*(T-1)<sup>4</sup>)</font></center> and of the mesoscopic heat friction <center><font size=”4”> <i>s<sub>T</sub>(T)</i> = kappa*(1+c<sub>1</sub>*(T-1)+c<sub>2</sub>*(T-1)<sup>2</sup> +c<sub>3</sub>*(T-1)<sup>3</sup>+c<sub>4</sub>*(T-1)<sup>4</sup>)</font></center> If the keyword power or kappa is not specified, the eDPD system will use constant power_f and kappa, which is independent to temperature changes. The mdpd/rhosum style computes the local particle mass density rho for mDPD particles by kernel function interpolation. The following coefficients must be defined for each pair of atom types via the pair_coeff command as in the examples above. where the first term in <font size=”4”>F<sup>C</sup></font> with a negative coefficient A < 0 stands for an attractive force within an interaction range <font size=”4”>r<sub>c</sub></font>, and the second term with B > 0 is the density-dependent repulsive force within an interaction range <font size=”4”>r<sub>d</sub></font>. where the parameters kappa and epsilon determine the strength of the Fickian and random fluxes. <font size=”4”><i>m</i><sub>s</sub></font> is the mass of a single solute molecule. In general, <font size=”4”><i>m</i><sub>s</sub></font> is much smaller than the mass of a tDPD particle <font size=”4”><i>m</i></font>. For more details, see (Li2015_JCP). The last 3 values must be repeated Nspecies times, so that values for each of the Nspecies chemical species are specified, as indicated by the “I” suffix. In the first pair_coeff example above for pair_style tdpd, Nspecies = 1. In the second example, Nspecies = 2, so 3 additional coeffs are specified (for species 2). The example for a mDPD simulation models the oscillations of a liquid droplet started from a liquid film. The mDPD parameters are adopted from (Li2013_POF). The short mDPD run (about 2 minutes on a single core) generates a particle trajectory which can be visualized as follows. The first image is the initial state of the simulation. If you click it a GIF movie should play in your browser. The second image is the final state of the simulation. The styles edpd, mdpd, mdpd/rhosum and tdpd do not support mixing. Thus, coefficients for all I,J pairs must be specified explicitly. The styles edpd, mdpd, mdpd/rhosum and tdpd do not support the pair_modify shift, table, and tail options. The styles edpd, mdpd, mdpd/rhosum and tdpd do not write information to binary restart files. Thus, you need to re-specify the pair_style and pair_coeff commands in an input script that reads a restart file. The pair styles edpd, mdpd, mdpd/rhosum and tdpd are part of the USER-MESO package. It is only enabled if LAMMPS was built with that package. See the Build package doc page for more info. (Li2014_JCP) Li, Tang, Lei, Caswell, Karniadakis, J Comput Phys, 265: 113-127 (2014). DOI: 10.1016/j.jcp.2014.02.003. (Li2015_CC) Li, Tang, Li, Karniadakis, Chem Commun, 51: 11038-11040 (2015). DOI: 10.1039/C5CC01684C. (Li2013_POF) Li, Hu, Wang, Ma, Zhou, Phys Fluids, 25: 072103 (2013). DOI: 10.1063/1.4812366. 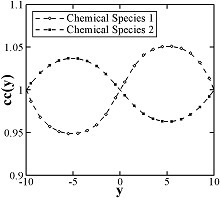 (Li2015_JCP) Li, Yazdani, Tartakovsky, Karniadakis, J Chem Phys, 143: 014101 (2015). DOI: 10.1063/1.4923254.